Xconomy: Could Future Car2go Trips Take You to Bellevue in a Black Mercedes? Could Future Car2go Trips Take You to Bellevue in a Black Mercedes? After a successful first year of service in Seattle, car2go—the pay-as-you-go, free-floating car rental service from German automaker Daimler AG—is researching the potential for expansion to the Eastside and a new business model that would appear to put it more directly in competition with the likes of Zipcar. 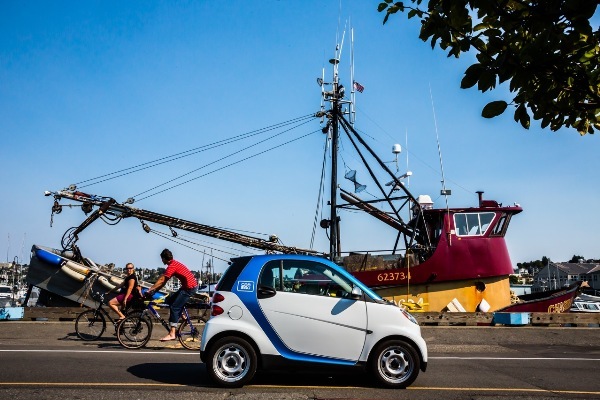 The company, which rents the diminutive blue and white Smart ForTwo cars on demand for 41 cents a minute (and at discounted rates by the hour and day), has registered more than 44,000 members in Seattle since it was opened to the public in December 2012. That makes it the fastest growing city in North America for the service, and ties Vancouver, B.C., for most users over all. So what does the future hold for car2go in Seattle? Car2go expanded its Seattle home area last spring to include more neighborhoods in the south and west of the city. It now covers 52 square miles. The fleet of free-floating car2go cars serving the city numbers 500, second only to the 578 in Vancouver. One thing that makes car2go different from other short-term rental services is that the cars move around the city, and can be picked up and dropped off in any legal on-street parking spot, rather than from designated spots where Zipcars are rented and returned. Using car2go’s mobile app you find a car near you, drive it where you want to go, park it for free (car2go has an agreement to pay the city for on-street parking), and walk away. I use it a few times a month for one-way trips downtown or out to a restaurant where I’ll meet companions who can give me a ride home. On Tuesday, car2go announced it is testing a new service in Germany called car2go black that includes Mercedes-Benz vehicles and elements of the Zipcar station-based model. It appears the company is researching whether its customers in Seattle might want this service, too. The car2go black pilot in Hamburg and Berlin, Germany, will offer black Mercedes-Benz B-Class five-door hatchbacks for on-demand, short-term rental. The vehicles can be rented at dedicated, reserved parking stations, but need not be returned to the same location. There are no time limits on how long they can be rented, nor are there scheduled return times. “With car2go we have revolutionized urban mobility. With car2go black we are now offering carsharing with Mercedes-Benz vehicles. We will thus be addressing a wider range of customers and enabling long-distance travel,” says Robert Henrich, head of Daimler Mobility Services GmbH, in a news release on the service. Zach Shaner at Seattle Transit Blog penned an in-depth post comparing the two services in Seattle a year ago. Car2go black could help the service better compete with Zipcar on this measure. Also worth noting, Zipcar is available in Bellevue and other Seattle suburbs, along with more than 50 other U.S. cities.